How Samuel Pepys was able to keep up a detailed daily journal for some 10 years is incredible. He was the Lou Gehrig of bloggers. Not that I’m in competition, but his observations were all over the place, ranging from the profound to the commonplace, very personal as well as observational on significant developments during his time. In an age of social networking though, with attendant privacy issues, I continue to walk the line. And, as I am but one of an endless number of bloggers, I increasingly find myself writing more for my own needs, a form of an auxiliary memory bank. Right now I’m sitting in a hotel room on NYC’s Upper West Side. The last entry was written while still on the boat. Lots of water under the proverbial hull since then, one wave in particular, but I’ll take this temporally. Before leaving the boat we returned to the Westport Country Playhouse to see The Understudy by Theresa Rebeck. This is a three handed farce / comedy which I would wage actors LOVE to perform. 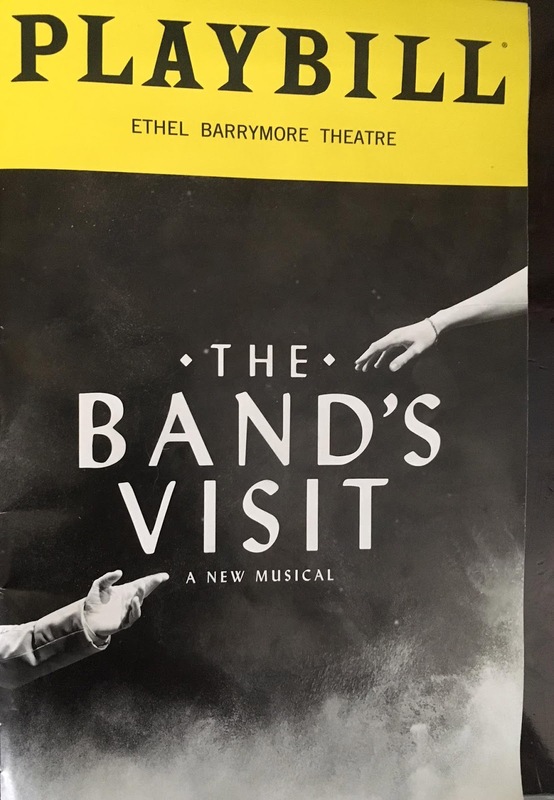 In this production are Eric Bryant, Brett Dalton, and Andrea Syglowsik (who plays the little appreciated stage manager, a function many of us theatre goers take for granted, perhaps as important as the Director). It’s a play within a play, supposedly an adaptation of a Kafka short story but in fact a Kafkaesque portrayal of life in the theatre itself. Wish I had photos and more time to spend on this production, but if the play comes your way, or if you are in the Westport area, see it (through Sept 1). Then onto the main event. Our son, Jonathan, was married last Sunday to the daughter we always dreamed of having, Tracie. It was an elegant but simple affair, the ceremony overlooking the water where we have spent countless days. It was an informal, non-denominational event, casual, no jackets, and no ties. This is the way they wanted it and we wholeheartedly approved! The wedding deserves its own detailed entry, and for that we must await our return to Florida. It was a wonderful day, sharing it with family, old friends, and new friends, and Tracie’s parents, Alan and Pat. More later. After the wedding we were going to go home, but why not use the opportunity to spend some time in our old neighborhood of the upper West Side? Two weeks in paradise, our hotel at 79th and Amsterdam, not far from where we both lived when we worked in the City. There is a cornucopia of little reasonably priced al fresco restaurants here with a sea of humanity passing by, every ethnic group, young people, babies galore, dogs shitting on the sidewalks, but people picking up after them, the blaring of horns, long walks early in the morning while Ann is having her coffee and getting ready for the day’s activities. I’ve walked over to Central Park and up and down Columbus, Amsterdam, and Broadway. Love the pulse of the upper WS and the fact that some markets are open 24 hours. I could live like this. 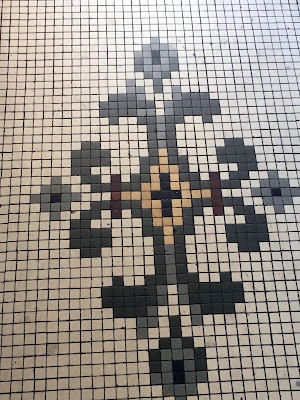 I have recaptured my NYC walking gait of almost 50 years ago, maintaining the necessary speed to traverse cross-town blocks without having to wait for a red light. I know that might sound silly, but it’s imprinted in my reptilian brain. 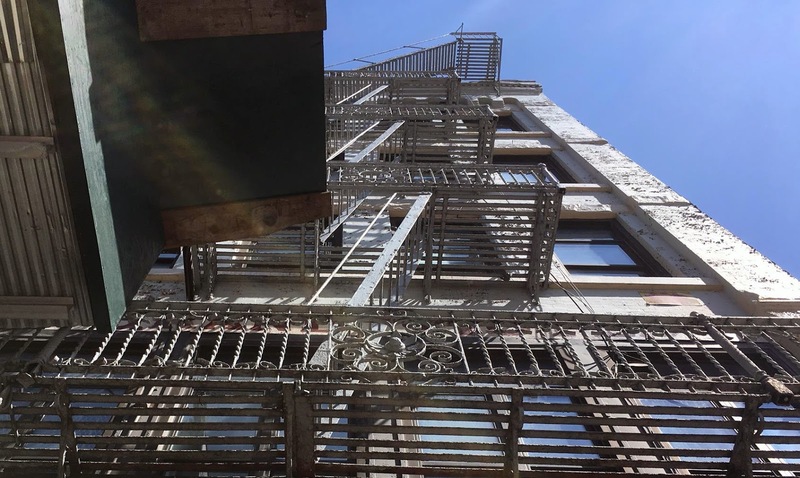 When I lived here I wish I had known that it was my moment, but time seemed endless and this neighborhood was not yet gentrified. One lived here just to go to work. 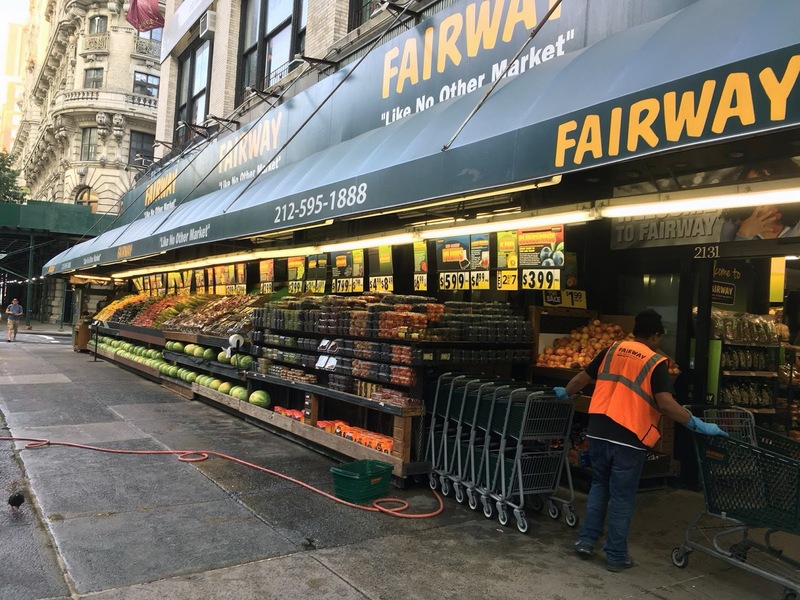 It is impossible to recount everything we’ve done since being in the City this last week, but I’ll reference a few highlights. Last year we focused on the theatre, but this year more on sites and museums. 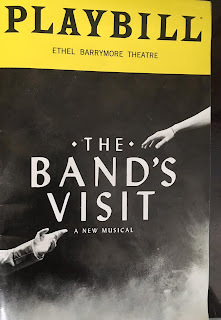 Nonetheless, one of our first nights here we saw The Band’s Visit. No time to do a “review” but I can well understand its several Tony Awards. It had such an inspirational message, with the power of music to unite. It starts slowly and gathers momentum. Musicians perform on stage and in the pit. Although the music is decidedly Middle Eastern, I could detect stains of melodies which reminded me of some of those in the movie La La Land. Just a few bars here and there and when I’m home and at my piano, I intend to identify them. 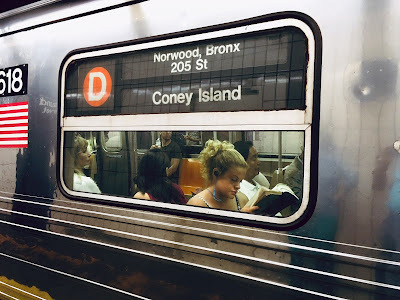 One day we took the B train (subway hasn’t changed much since we lived here decades ago, other than the price and they’re now air conditioned) downtown to Grand Street. The D train went by as we waited for the B. There were three reasons for this day trip. 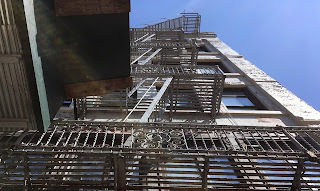 First was to tour the Lower East Side Tenement Museum, choosing their Shop Keepers tour as it focuses first on my German heritage, and then on Ann’s Jewish heritage. Their site on line provides all the details so I am not going to go into them, other to say one could make this an all day visit with the other available tours. Some time ago the Tenement Museum had contacted me about recreating my great grandfather’s photography studio which was established at nearby 143 Bowery in 1866. Unfortunately, nothing came of that. But while downtown I wanted to see the building which is still there today, although under constant renovation. 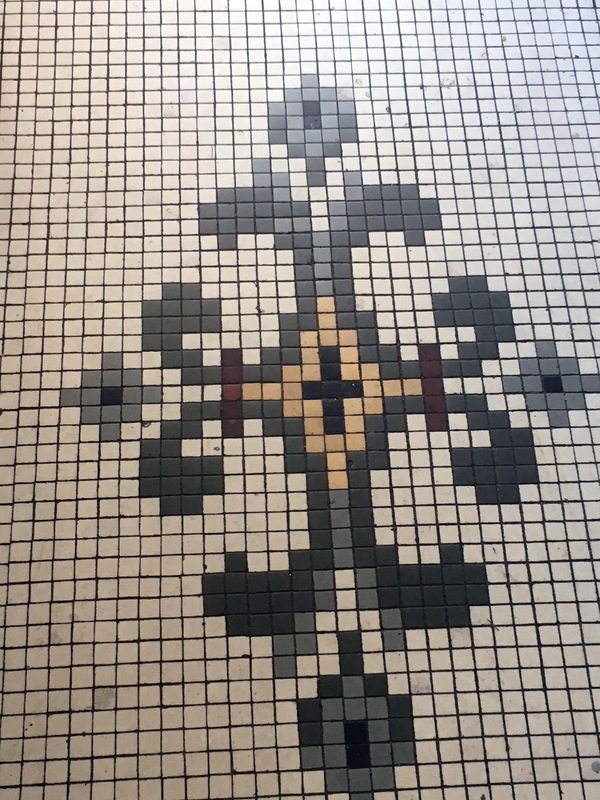 It was strange standing in the vestibule, probably on the very floor my great grandfather walked. The photography business survived some 120 years although it later moved to 100 5th Avenue. 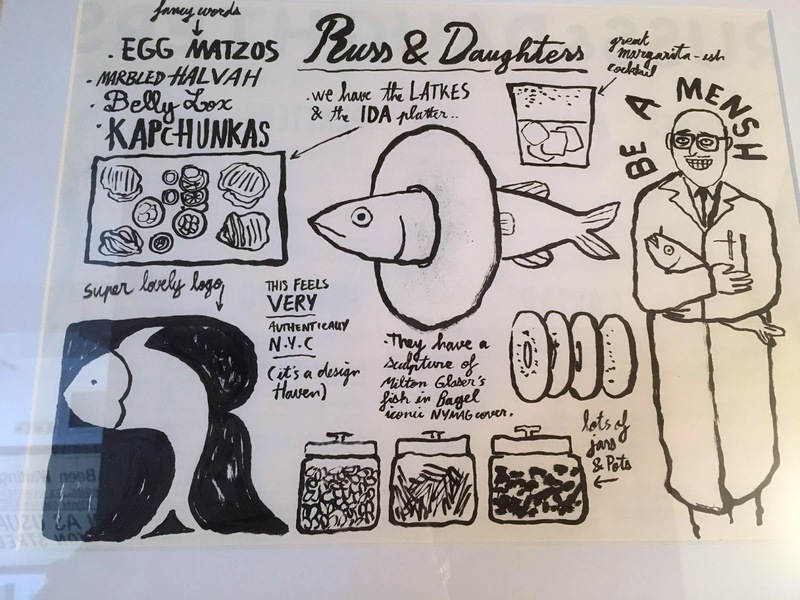 Then, how could we not have a late lunch at Russ & Daughters while there? Here I’ll supply some detail, having shared a pickled herring trio on pumpernickel, potato latkes with sour cream & applesauce, a scooped bagel with nova smoked salmon, cream cheese, tomato, onion and capers and finished with blintzes with fruit compote & sour cream. 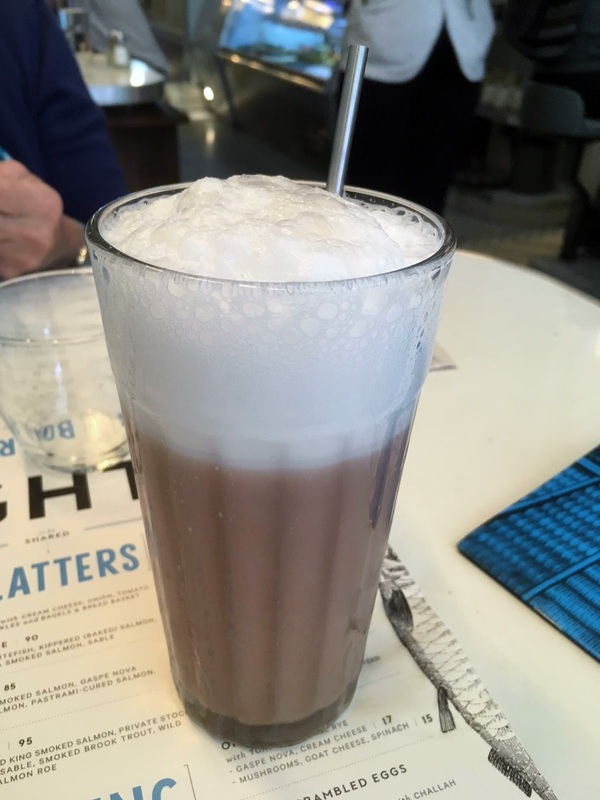 While Ann drank a white Spanish wine with the meal, I could not resist the beverage of my youth, a chocolate egg cream. Ironic, there is no egg and no cream in the drink, just some chocolate syrup, a splash of milk and lots of seltzer. As a kid it was what you ordered when you couldn’t afford chocolate malt, which was most of the time. 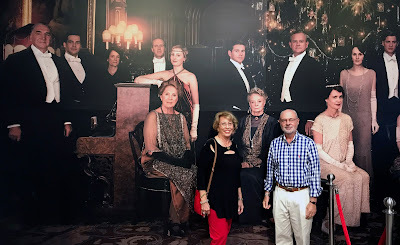 Yesterday we went to Downton Abbey: The Exhibition which is soon closing. We had watched each and every episode over the last few years and even visited the castle in Scotland where their initial Christmas show was filmed. Now we understand there will be a movie to continue the series. Can’t wait. 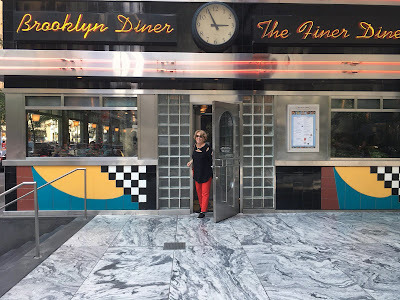 Afterwards, we ate an early dinner / late lunch at the nearby Brooklyn Diner, sharing a pastrami sandwich -- as it was made in the days of Ebbets Field, exactly the period the Diner tries to capture. As this is undoubtedly the last entry for this month, a brief political observation about Mr. Manafort and Mr. Cohen. They can’t possibly be guilty as Trump appoints only the best people! At least 33% of the public still believe that. Add to the pot the admission of the National Enquirer about their role. Their influence was as pernicious as Russia’s on the election, all condoned by an unknowledgeable, self-centered “celebrity” WE elected President. How much longer will the GOP allow him to go on before destroying our country and any sense of respect for the office of the President?